"Millet has a great thick consistency when cooked up (kind of like mashed potatoes) which makes everything work well for this. I am on a pretty strict diet since I have candida, so this recipe is perfect for early stage candida diet and provides doing something a little different with millet." Bring 1 1/2 cups water and millet to a boil in a saucepan; reduce heat, cover saucepan, and simmer until water is absorbed, 10 to 15 minutes. Fluff millet with a fork. Bring a pot of water to a boil; cook zucchini until slightly tender, about 5 minutes. Drain water. Cut zucchini in half lengthwise. Spoon meat out of center, leaving a 1/8- to 1/4-inch border in zucchini. Reserve zucchini meat. Heat ghee in a skillet over medium heat; cook and stir onion, red bell pepper, and garlic until slightly soft, about 5 minutes. Stir millet, zucchini meat, and salt into onion mixture. Slowly pour 1/4 cup water into mixture while constantly stirring; cook until desired consistency is reached, 3 to 5 minutes. 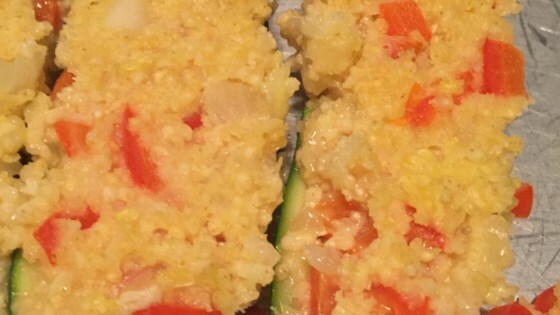 Spoon millet mixture into hollowed zucchini and place in a baking dish. Bake in the preheated oven until browned on top, 15 to 20 minutes. Coconut oil or olive oil can be used in place of the ghee, if desired. Add salt/seasoning to flavor when they are done if they are to bland for you. Try some tzatziki sauce/dip. I found that to be a great addition on the finished product. Thank you for this recipe... I am also on the very strict Candida diet and constantly looking for new ways to fix the same food. This one is delicious!